Expose a little clear, cool soup-stock to the air for a few minutes; then cover it with a piece of clean glass, set it aside in a rather warm place, and look at it every day. What happens to it? How does it smell after a few days? What do we say has happened to it ? If we should examine a speck from one of the cloudy spots on soup-stock, under a microscope, we should see many bacteria. Bacteria are single-celled forms of plant-life, like yeast; and, like it, they multiply when they have warmth and food and moisture. They exist in far greater numbers than yeasts do, however, swarming in the air, in water, in the ground. Some are shaped like lead-pencils, others like eggs or billiard-balls, and still others like corkscrews. One kind is so small that fifteen hundred in a row would hardly reach across the head of a pin. Fig. 15. - Shapes and groupings of different kinds of bacteria (much enlarged). Fig. 16. - Bacteria causing typhoid fever, as seen under the microscope. 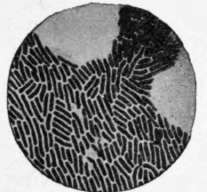 Bacteria multiply by dividing themselves in two, repeating this process so frequently that were there food and room enough for them all, the world would soon be crowded with them. But they die by millions constantly, one kind overcoming another, while all kinds are destroyed by the occurrence of conditions unfavorable to life. 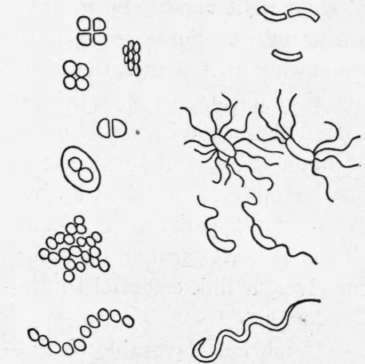 Some kinds of bacteria form spores (p. 128). Spore-formation corresponds in a way to the going to seed of bigger plants, when winter comes on. Spores are usually very hard to kill. They seem able to last forever, ready to spring into activity when right conditions return. Many kinds of bacteria are harmless. Some are useful. Even those that are troublesome when they attack the food we want to keep do good when they decompose such things as the dead bodies of animals, dead plants and leaves, manure and other waste. They feed upon these, and break them down into inorganic substances suitable to be taken up by plants and again built into living matter, perhaps to become food for animals and men. Thus bacteria form an invisible link between the soil and ourselves, a link essential to life on the earth. Conditions favorable to the growth of yeast being, in general, favorable to the growth of bacteria and mould,1 the way to keep all microorganisms from destroying food is to provide conditions just the opposite of those we provide for yeast in bread-dough. We may keep the food very cold, make it very hot, dry it, or since we cannot take out of it the food microorganisms live on, put into it something to kill them or at least to check their growth. (See disinfectant, p.30.) Any substance used in food for this purpose is called a preservative. Salt, vinegar, alcohol, spice, and sugar (in large quantities) have long been used as preservatives. Would a little sugar hinder or favor the growth of yeast? Is alcohol a desirable preservative? (See p. 144.) Wood-smoke deposits substances which have a preservative effect. What foods are smoked? 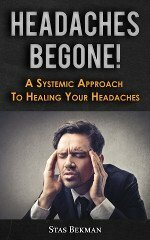 All chemical preservatives, including benzoate of soda and "canning-powders," are objectionable, even in small quantities. There is no need of them in food fit to eat, and they should not be used to conceal the condition of unfit food. Meat, fish, poultry, eggs, butter, and fruit may be kept for months in cold storage. They undergo some change, however, and are likely to spoil quickly when taken out. 1 Except that yeasts and moulds require air, and many bacteria do not. The most effective way to keep food is to sterilize it; that is, to cook it enough to free it from all living microorganisms. If we do this and then seal it up so that no more can get in, it will keep indefinitely. This is done in canning. Buchanan : Household bacteriology. Ch. 2-9 inclusive, 23, and 25, pp. 223-228; ch. 24, Alcoholic fermentation of fruit juices. Elliott : Household bacteriology. Pp. 47-55 and 68-74. Prudden : Story of the bacteria. Conn : Bacteria, yeasts, and molds in the home. (Especially ch. 10, Preservation of food; 11, Preservatives, and 12, Preservation by canning. For experiments see pp. 271, 276, 280.) Greer : Food - what it is and does. (Functions of bacteria. Nitrogen and carbon cycles in nature, pp. 72-74.) U. S. Dept. of Agriculture : Farmers' bulletin: 375. Care of food in the home.